There are two versions to use in the testnet. The install packages are zip files. They contain the programs and folders that will be used for the blockchain. It doesn't interfere with other wallets on your system. Unzip these folders where you want and run the "1. start-client" command. Other commands such as mining may be present in the packages. If you delete the package after unzipping and running the client, you will loose your wallet. Information to be added later. 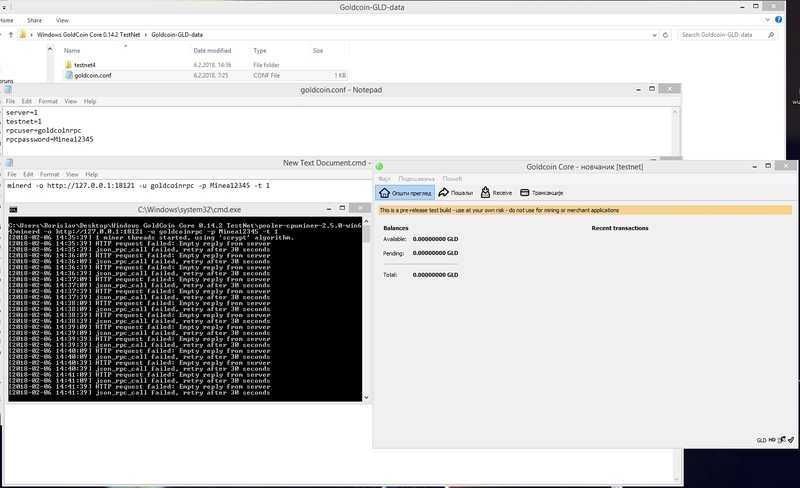 /* This allows the pool to connect to the daemon as a node peer to receive block updates. Please Join In on the TestNet part 2. This test should last about 1 week, unless we find some serious bugs! "errors": "This is a pre-release test build - use at your own risk - do not use for mining or merchant applications"
You should not modify the scripts provided in the zip file I think, just follow the instructions from the first post. [2018-02-06 16:55:03] 4 miner threads started, using 'scrypt' algorithm. For the 0.14.2.1 client the same steps. 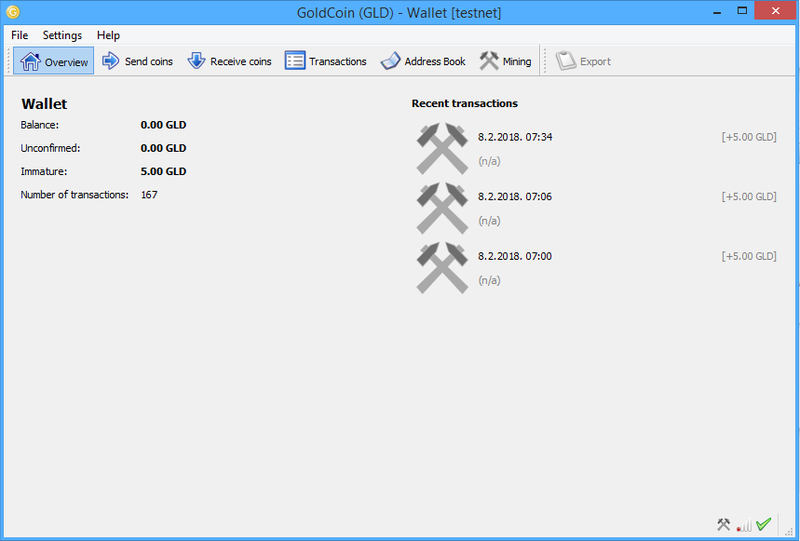 -start mining now on the goldcoinpool.com with new client using my gpu and cgminer 3.7.2.
if you want to something during mining then use a lower itensity, if you want to run it during the night, you can use a higher intensity. You are trying to mine with cpuminer and the new client. This doesn't work and it only possible with the old client. You are trying to mine with cpuminer and the new client. This doesn't work and it only possible with the old client. Mining is no longer working with the old client, by design. 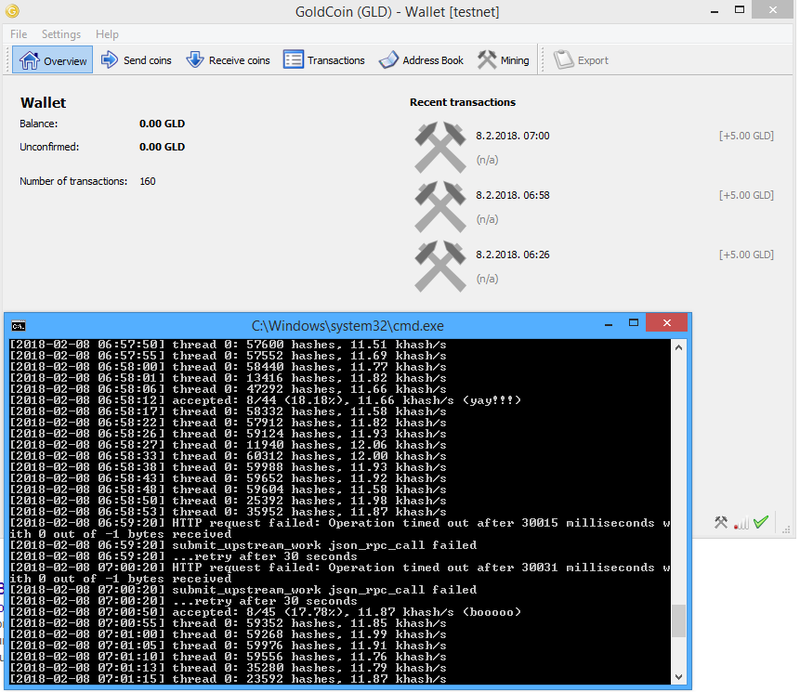 You can try to mine with the old client and let me know if any blocks are mined and accepted. Yes, it does not work, too. There were 5 immature coins for just one block, nothing more. Thank you for confirming. The old client will show that it tried to mine blocks, but they are not confirmed. At one point the old client on my system had 3 blocks that were confirming (but they were later orphaned). Before we can release the new wallet, we need more testing of transactions between old and new clients. It's important that the community do some of this testing because otherwise a bug could go overlooked.. Please ask any questions and post results below. I did several transactions between the old and new client last week, with and without fee etc. Got from MG 3500 GLDs to check transaction between old and new wallet.